Exposure to asbestos from living within the vicinity of a qualifying operation. These are claimants who were exposed to asbestos in their living environment due to its proximity to qualifying operation. The claimant must have been diagnosed with a compensable asbestos-related disease caused by exposure to asbestos in one of the above situations. Criteria for Dependents of Deceased Miners to Lodge a Claim. The claimants must be able to prove that they were financially dependent on the deceased. All criteria must be met in order for an application for compensation to be processed. What Does A “Qualifying Operation” Mean? A qualifying operation refers to a mine, mill or other business operation which was owned by or associated with one of the Founders of the Trust. Qualifying operations for the Trust therefore only include companies owned by or associated with the Griqualand Exploration and Finance Company (Gefco), Gencor Limited (Gencor), and, Msauli Asbes Beperk (Msauli). Compensation categories indicate the Asbestos-Related Diseases for which compensation can be paid. All medical records of potential claimants are read by the Specialist Occupational Medical Panel, an independent panel of occupational medicine specialists, set up by the Trustees, whose responsibility it is to assess the medical information and to evaluate each case to the best of their professional ability. What are the main types of asbestos lung disease? In the human body, asbestos affects the lungs most of all. It can affect both the spongy parts as well as the outer lining of the lung. It usually causes disease in a person 10 to 50 years after they were first exposed to asbestos. The four main lung diseases caused by breathing asbestos dust are asbestosis and Asbestos-Related pleural thickening – these are the scarring diseases, Asbestos-Related lung cancer, and mesothelioma – these are the cancers. Asbestosis is an irreversible and progressive lung condition which results from the inhalation of asbestos fibres over an extended period. It occurs because asbestos fibres are inhaled into the tiny air sacs deep in the lungs, and these cause those air-sacs to thicken, which reduces the amount of oxygen taken up and the amount of carbon dioxide removed. This then causes shortness of breath and coughing. Asbestosis is caused by the inhalation of asbestos fibres over an extended period. The fibres lodge in your lungs and are not expelled. Is there a cure for asbestosis? Asbestosis has no cure and no specific treatment. Because of the tiny scars in the lungs, it may eventually over years cause the sufferer to start a dry cough, and become short of breath. Sufferers are advised to avoid any further exposure to dusts or asbestos or irritants that make them cough. They should never smoke and all chest infections must be promptly treated. Sometimes scarring occurs on the thin membrane that is the outer lining of the lungs, called the pleura. When seen on chest x-ray, this scarring is called pleural plaque or pleural thickening. Is there a cure for asbestos related pleural thickening? Asbestos-Related pleural thickening has no cure, and most often there are no symptoms and also no change over time. Sufferers are advised however, to take special care of their lungs. They should never smoke and all chest infections must be promptly treated. This is cancer of the thin membrane on the outer lining of the lungs – the pleura. It is caused exclusively by asbestos, and is a very aggressive and painful cancer. These tumours can take up to 50 years to develop. Mesothelioma is incurable, and is usually fatal within 12 months of diagnosis. Sufferers are advised to get their affairs in order as soon as possible, as decline in health occurs very rapidly in the late stages. Hospice referral should be organised immediately in order to alleviate the extreme pain, breathlessness, coughing and weakness which almost always occur. Mesothelioma is an aggressive and incurable cancer that occurs on the outer surface of the lungs. It can also occur in the abdomen. It is caused by exposure to asbestos, usually from breathing in invisible fibres on a job where asbestos was used. The cancer starts as a weeping of the lung surface – causing pleural effusion – and then progresses to small nodules which eventually coalesce into a large thick sheet of growth which envelops and squeezes the lungs. This causes pain, breathlessness and weakness, to which sufferers then succumb. The time latency between breathing in the asbestos and the development of the disease is long – typically more than 20 years – but the risk is life-long, and increases with age. The more fibres one has breathed in and the longer the fibres stay in the lungs, the greater one’s risk. The lungs are unfortunately a cul-de-sac for these microscopic fibres and they cannot be cleared nor removed. The number of fibres required to initiate mesothelioma can be relatively low, so people who are environmentally or occasionally exposed to asbestos are also at risk. Mesothelioma is remarkably quite rare even in occupationally exposed groups, but it is devastating for the individual. Early recognition as to the cause of the pleural effusion – differentiating it from other causes like TB – is key to good medical and palliative management. Surgery is generally advised for diagnosis only. Lung cancer caused by asbestos is identical to lung cancer caused by smoking, but they are more common in people who have worked with asbestos, especially if they also had asbestosis. Asbestos and cigarette smoke work together to cause lung cancer. We cannot however predict who is going to get lung cancer. Lung cancer is usually untreatable. What are the symptoms of asbestos related lung cancer? Is there a cure for Asbestos-Related lung cancer? Asbestos related lung cancer is usually incurable, and is generally fatal within 12 – 18 months. Sufferers are advised to get their affairs in order as soon as possible, as decline in health occurs very rapidly in the late stages. Hospice referral should be organised immediately in order to alleviate the symptoms of cough (often bloody cough later), shortness of breath and chest pain. Pneumoconiosis is a dust disease of the lung caused by breathing in excessive amounts of dust, usually from doing dusty work. Gold miners get silicosis, Coal miners get coal workers’ pneumoconiosis and asbestos miners and workers get asbestosis. What could be other causes of pneumoconiosis? Pneumoconiosis can be caused by any excessive dust that a person inhales. Which diseases are compensated for the Asbestos Relief Trust and /or the Kgalagadi Relief Trust? Only Asbestos-Related dust disease is compensated by the Trusts, and only in those people exposed to certain qualifying operations, during the years when the founding companies of the Trusts (Gencor, Gefco, Msauli and Becon) owned, controlled or managed certain operations. How do Asbestos-Related Diseases develop? Asbestos-Related Diseases develop because the little unseen spike-like fibres that are inhaled get into the lungs and stay there, causing scars and cancer to develop many years after they are breathed in. How long do Asbestos-Related Diseases take to develop? Exposure to asbestos fibres can cause disease in a person 10 to 50 years after they were first exposed. The risk of disease is lifelong. At present, there is no curative treatment for Asbestos-Related Diseases or cancers. For asbestosis and asbestos-related pleural plaques, it is important to maintain good respiratory health with regular visits to the clinic and early treatment of any other chest diseases or infections. We also advise you to keep away from dusty or smoky areas, especially any asbestos dust, and to stop smoking. For asbestos-related lung cancers and mesotheliomas, palliative care is available from clinics or hospices. What is the minimum exposure period that puts me at risk of developing an ARD? There is no minimum exposure period. Any exposure to asbestos puts you at potential risk of developing an asbestos related disease. Asbestos-Related Diseases are not contagious. How are Asbestos-Related Diseases diagnosed? Asbestos-Related Diseases are diagnosed using the following combination of tests: Chest x-ray, Lung function testing and medical examination. If you are suspected of having cancer, biopsies and CT scans will be required. I was exposed to asbestos fibre is there anyway of minimising my risk of developing ARDs? Any significant exposure to asbestos puts you at a lifelong risk of developing an asbestos related disease, especially if you were exposed at work. Why do some people develop asbestosis and others develop an asbestos related cancer? We do not know – different people respond differently to the same toxins. Most people who are exposed to asbestos do not develop a disease. Is TB the same as asbestosis? Tuberculosis is not the same as asbestosis. TB is an infectious lung disease that spreads through coughing from person to person. Asbestosis is a dust disease of the lungs that occurs because of excessive breathing-in of asbestos dust. Can I develop TB from being exposed to asbestos fibres? TB cannot develop from being exposed to asbestos fibres. If I have asbestosis will my disease progress? In some cases yes, but in most cases it remains stable, provided there is no further exposure to asbestos. I worked at an asbestos mine for all of my working life but have not been diagnosed with an ARD. My neighbour worked for a very short period at an asbestos mine and has an ARD. Why has he developed an ARD but not me? Some people get sick from asbestos and others do not. Anyone who has been exposed to asbestos, even non-miners, can get any of the Asbestos-Related Diseases. The more a person has been exposed, the more likely it is that they may get an asbestos disease. But most miners that the Trusts have tested do not have any Asbestos-Related Diseases. The reasons for this are not clear. There is medical evidence of claimants with long exposure histories and no signs of asbestos-related disease on chest x-ray and others with very short exposures who unfortunately have contracted an asbestos-related disease. There are also families who are more genetically susceptible to getting an asbestos-related disease, but more research is needed to understand this better. Approximately 30% of former mineworkers seen by the Trusts have developed an asbestos disease, and about 2% of these have asbestos-related cancer. What does the Trust mean by occupational diseases? The Trusts use the term occupational diseases if you were exposed to asbestos at work. What does the Trust mean by environmental diseases? If you were exposed to asbestos in another setting, they are called environmental diseases by the Trust. Mine workers who were exposed to asbestos from qualifying operations and who have developed an asbestos-related disease. Can individuals who lived near the mines also claim? Yes. Individuals who lived at or near a qualifying mine and have an asbestos-related disease. What happens if the individual has died, can family members claim compensation? The deceased died of mesothelioma or asbestos-related lung cancer. Qualifying operations are the mines, mills and other operations owned by or associated with the Founders of the Asbestos Relief Trust. The Founders are the companies which provided the money for payment of compensation to qualifying claimants. What is the Qualifying Period? The qualifying period is the period that the mines, mills and other operations were owned by or associated with the Founders of the Asbestos Relief Trust. Which mines/mills must I have worked at to qualify to claim? Mines and mills owned by owned by the Griqualand Exploration and Finance Company (GEFCO) and African Chrysotile Asbestos (ACA)/Msauli. How can I prove that I have worked for a qualifying operation if I no longer have any documents? You may approach the offices of the Asbestos Relief Trust for assistance in obtaining proof that you worked for a qualifying operation. What illness must I have before I can claim for compensation? Asbestos dust disease means either asbestosis or asbestos related pleural thickening. How can I prove that I am ill? You can contact the Asbestos Relief Trust’s office directly and a trust official will assist you. If you live within the Kuruman community you may also approach the Asbestos Interest Group or Dr Grobler who will assist you further. How do I contact the trust’s office? You may contact the Trust on 011 482 1000 and a trust official will help you. You may also send a “Please Call Me” message to 082 210 5991 and a trust official will phone you back to help you. What will it cost to apply to the Trust? It will not cost you anything to apply to the Trust. It is a free process if you apply directly. Are there any other organizations that can assist me to apply for compensation? The Trust offices are the best places to go. In Kuruman, the Asbestos Interest Group (AIG) and Dr Grobler can also assist. They will not charge you anything for providing assistance to lodge a claim with the Trust. You may call the Johannesburg office of the Asbestos Relief Trust for more information. Do I have to take along any documents when I go and apply for compensation? Medical records, if you have previously been to a doctor who has diagnosed you as suffering from an asbestos-related disease. Proof that the deceased worked at a qualifying operation if you have this. If you were exposed environmentally you should take a copy of your identity document and your medical records which show that you have an asbestos-related disease. An official will assist you further. What happens when I arrive at the meeting to apply for compensation? An official will assess whether you have a potential claim. If you do you will be sent to a doctor for medical examinations. These medical records will be assessed by a panel of specialist occupational health experts. If you have an asbestos-related disease you will be requested to complete an application for compensation. What happens if I do have a compensable asbestos disease? The application forms will be sent to the Trust’s office in Johannesburg where your award will be calculated and claim processed for payment. Will I be informed of the award before payment? Yes. Before the Trust pays any compensation to you a trust official will inform you of the award amount. The award will be paid directly into your bank account once you have accepted the calculation and submitted a signed Release and Discharge Form as required by the Trust Deed. Can I claim again if my medical condition becomes worse? You may reapply if you develop mesothelioma or asbestos-related lung cancer. If you feel that your condition has got worse, the best is to get a Chest X-Ray that you will need to pay for and send that to the Trust. The specialist panel of occupational health experts will look at it again and advise you of the outcome. If your doctor has told you that your condition is worse, ask them to send the Chest X-Ray to the Trust. What happens where I did not meet the medical criteria to qualify for compensation the first timethat I went for a medicalexamination? You may reapply if you did not initially qualify medically for an award, and believe that your condition has now worsened due to asbestos exposure. The Trust will however not pay for the medical expenses of this re-application. 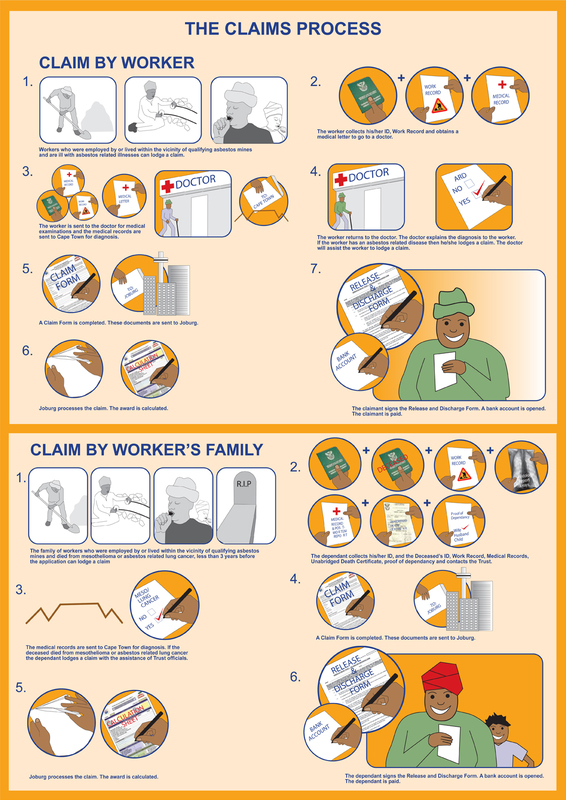 The Occupational Diseases in Mines and Works Act (ODMWA), provides that every ex-mine worker is entitled to go for free regular medical check-ups every 2 years at a Government Hospital to see if they have developed a compensable occupational lung disease in terms of ODMWA. We recommend that you go for these regular medical check-ups with the Medical Bureau for Occupational Diseases. Sometimes the Medical Bureau for Occupational Diseases (MBOD) pays out compensation to a miner, but the Trusts deny them compensation. Why is this? Usually, the MBOD and the Trusts would agree in their findings, but they operate under different rules. The differences usually occur because the worker has got sick from another dust disease of the lung, one that is caused by silica dust from the gold mines or coal dust from the coal mines. Sometimes also the MBOD will pay for tuberculosis, whereas the Trusts do not. The Trust also requires lung function tests, whereas the MBOD does not always need this test. On the other hand, the Trusts compensate for asbestos disease earlier than the MBOD, and also compensate environmental claimants who did not work for the mines but lived at or near and were exposed environmentally. The MBOD only compensates ex-mineworkers. What is the relationship between the Trust and the MBOD? The Asbestos Relief Trust and the MBOD are two separate organizations with different processes and methods of claiming compensation. What is the effect of my employment at other mines? If you have been diagnosed with asbestosis and worked at other non-qualifying asbestos operations or mines that were not owned by the Founders your award will be apportioned on the basis of total exposure. Will I also qualify for compensation if I also worked at a Cape PLC mine and was compensated through the British court case? If you were compensated by Cape PLC, the Trust Deed does not allow you to apply for compensation under the Asbestos Relief Trust as well. See clause 8.2 of the Trust Deed. What if I die before my asbestos disease is diagnosed? All ex-mineworkers can have their hearts and lungs removed after they die, to be sent to Johannesburg for a post-mortem or autopsy examination. In Kuruman, the programme is managed by Dr Lady Jood, who will arrange with Sr Magabanyane for the expert and sensitive removal of your heart and lungs. The result of the autopsy is usually available in about 5 months. What about exposure to asbestos cement material like asbestos roofs, water tanks, pipes and gutters? The Trust does not compensate individuals for exposure to this material. The risk to the community exposed to asbestos cement material in houses is generally low, but we need to warn that no asbestos material is safe. Asbestos cement material is safer than powdery asbestos because the asbestos fibres are held in the hard cement. Do not disturb asbestos cement material, and ensure it is well maintained and painted. Do not use any power tools on it, do not sand it, and do not use high-pressure hoses on it. If it needs to be removed, one should use approved contractors whose workers have been trained to work with it safely, as guided by the Asbestos Regulations of 2001. What is the relationship between the Asbestos Relief Trust and the Kgalagadi Relief Trust? The two Trusts are separate bodies with their own Trust Deeds. They are though similar in that they both provide compensation to qualifying claimants who have developed compensable Asbestos-Related Diseases as a result of exposure to asbestos dust from specific operations. The main difference between the Trusts is that they do not cover the same operations. 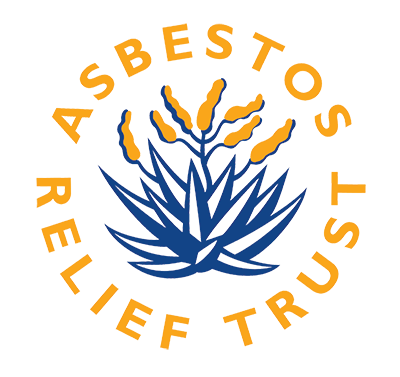 The Asbestos Relief Trust provides certain administrative services to the Kgalagadi Relief Trust in terms of a service level agreement.